Hey new dish for me. I'm from tanjore, but not had this yet. Will give a try. 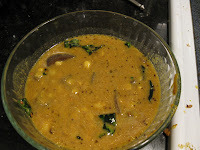 Poricha kozumbu is yummy..Wishing You and Your Family a Very Happy New Year. Wow yummy and spicy recipe. 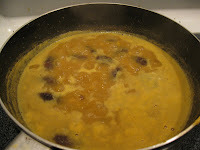 i will try out this recipe.. can you pls put up a recipe for "melagu kozhambu"
Few doubts.. I think mentioning chenna and toor dhals to be cooked separately is a good idea..usually for me chenna takes longer to cook. How long do you cook it to get a good softness? 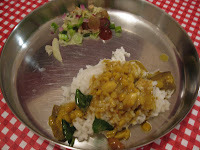 I am also new to Thogayal Saadam, is this a mixed rice dish? Thanks.